I love all things patriotic! I absolutely LOVE the 4th of July holiday as well! 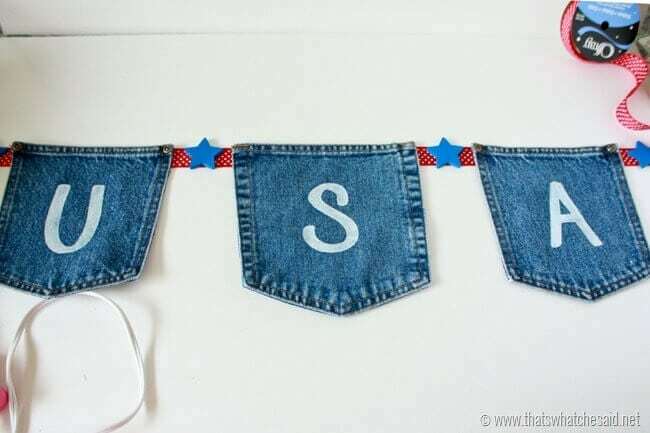 This Jean Pocket USA Bunting sign can be used for all things red, white and blue! You can also use it as a simple banner for your mantel, as front door decorations or you can even stuff the pockets and put it to use at your food table! Multi tasking at it’s patriotic finest. 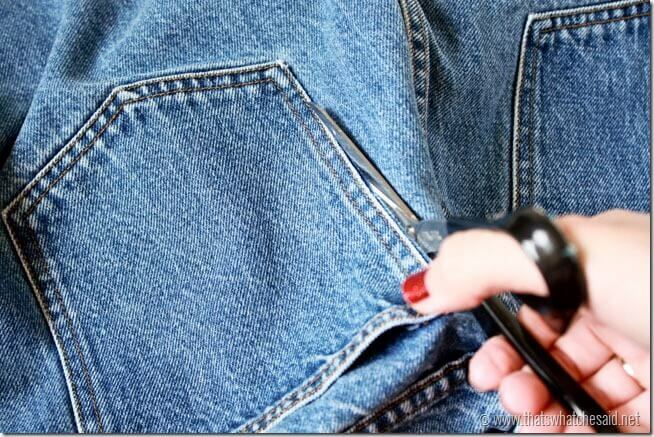 Start out by cutting out your pockets. I left the back jean part to actually keep them as functioning pockets. Cut just under the Pocket Seam. 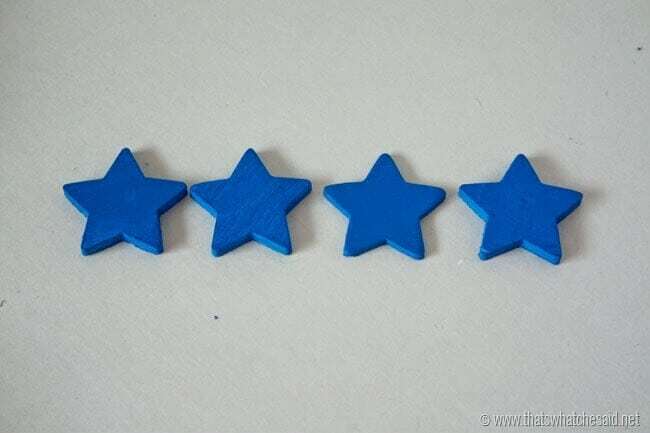 Lay them out flat to get the best placement if they are a bit different size wise. 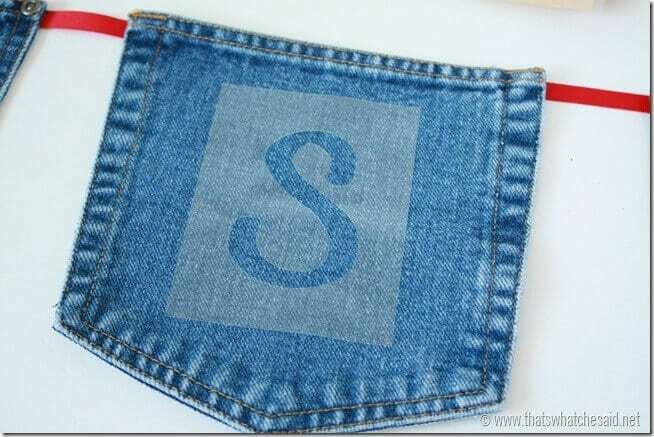 One of my pairs of jeans had slightly bigger pockets. 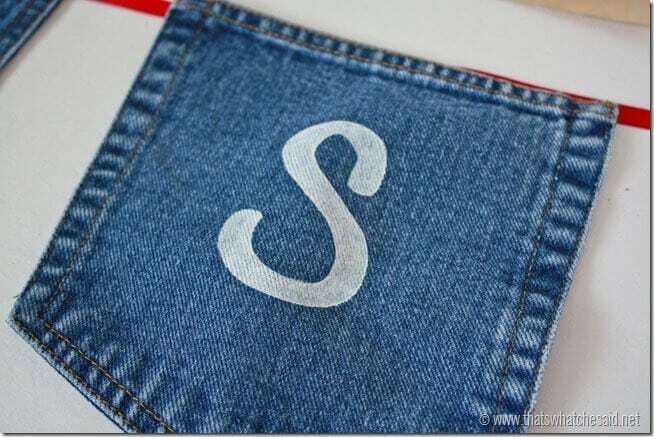 Next you will stencil your USA on the pockets with white paint. You can use a stencil set that can be picked up at any store that has art supplies or you can use my stencils that I made and used with my Silhouette CAMEO. 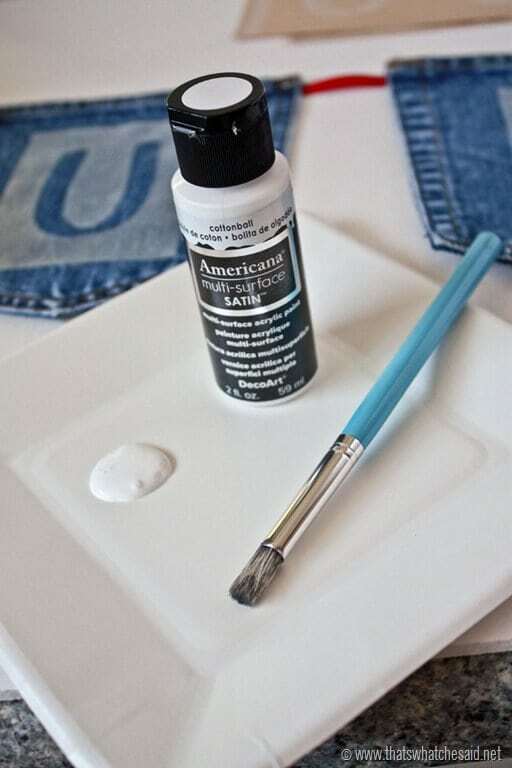 Next using white paint and a stencil brush, I stenciled in the USA. I use a stencil brush because I feel it gets into the nooks and crannies of the texture of the fabric better than a foam or regular paint brush. Stencil brushes have very brash stiff bristles. Next remove your stencil vinyl and you will have a nice letter! I painted four small wooden stars blue. I laid out my ribbon, pockets and stars and spaced accordingly. I then hot glued everything down onto the ribbon. 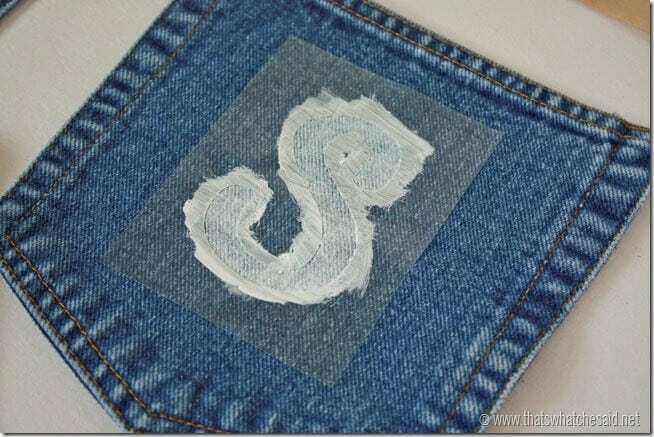 NOTE: If you want to keep the pockets functioning, make sure you only glue the back side of the pocket to the ribbon! And there you have it! This banner can be used for so many things. 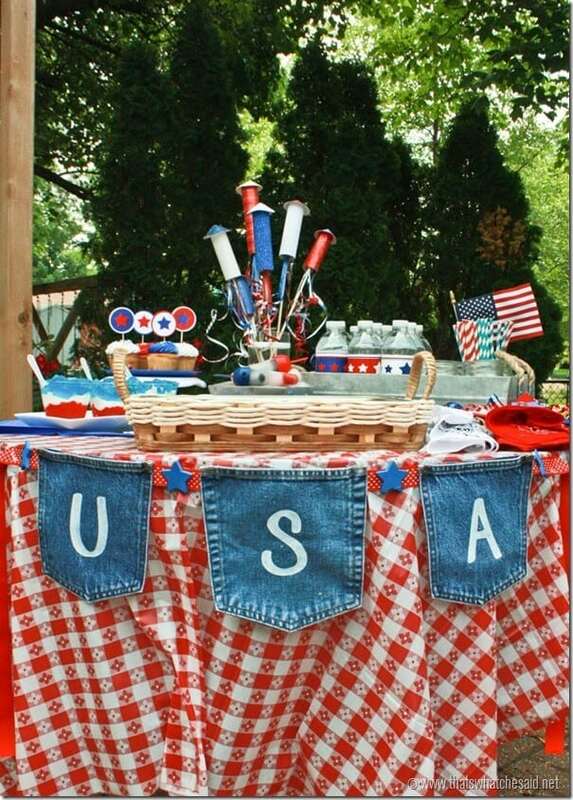 Here I used it on my 4th of July Celebration table! 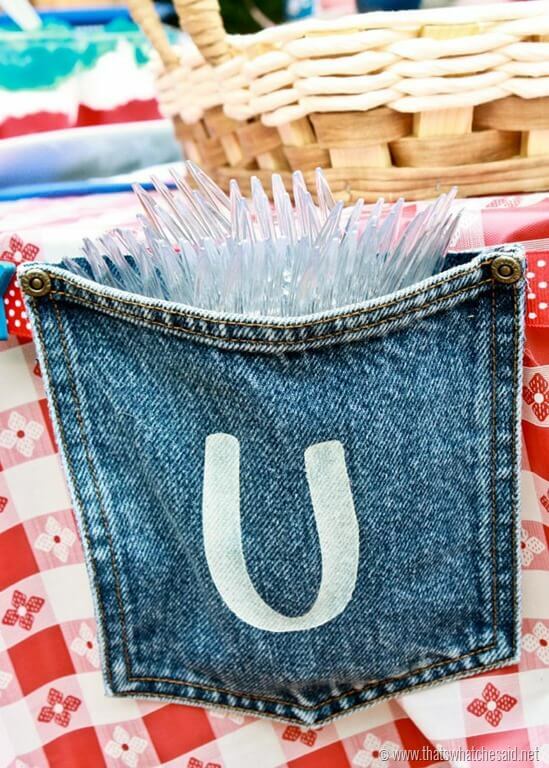 You can even stuff the pockets with things like napkins and utensils that are useful when eating my One Pan Flag Cake! 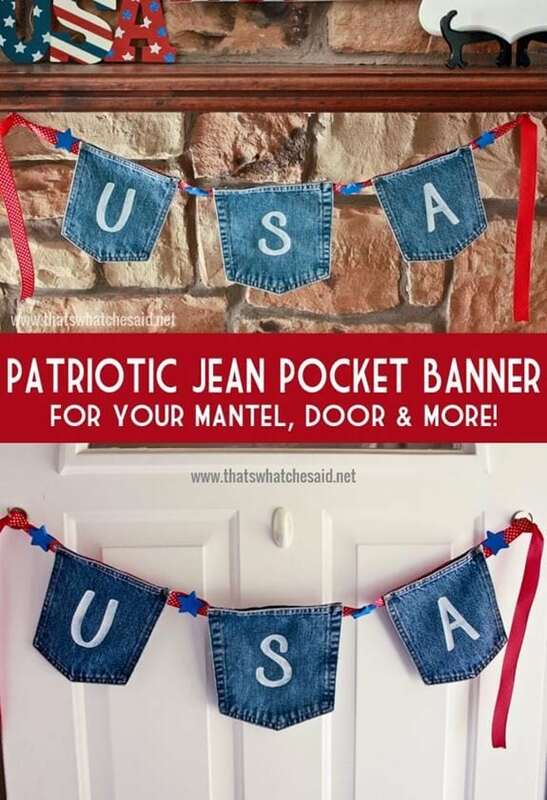 Or you can even string it up on your front door in place of a wreath! You know me…I like to break all the rules and put non wreath items on my front door! 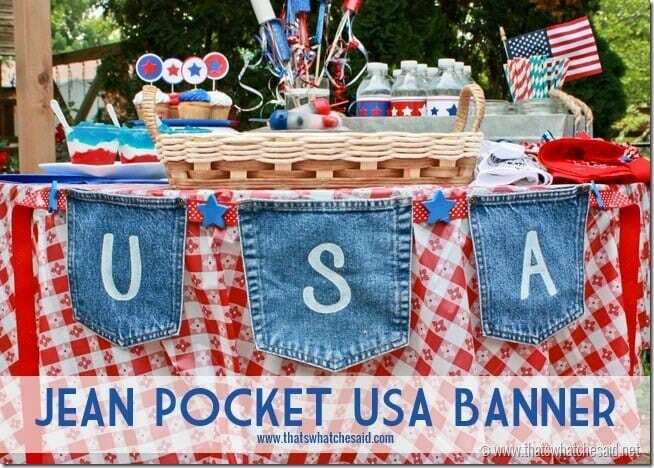 What would YOU use your Jean Pocket USA Banner for? 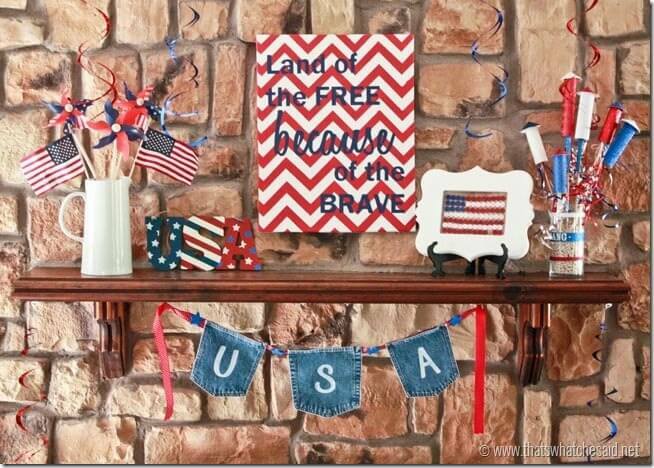 I’d love for you to check out all my patriotic projects! I have some great free party printables as well as great mantel décor and recipes! Super cute!! 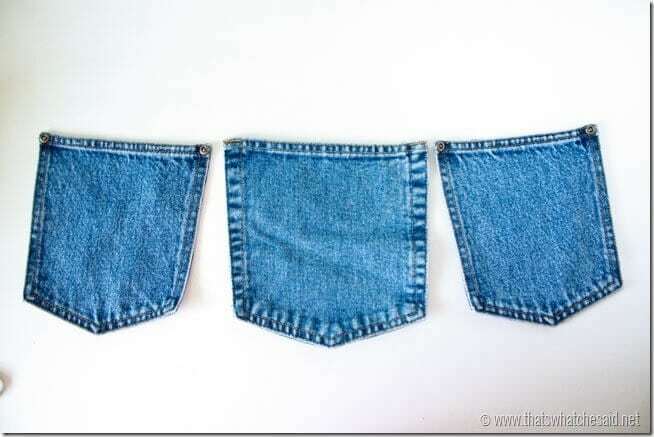 What a great idea to use jean pockets. Love it!! Pinned!! 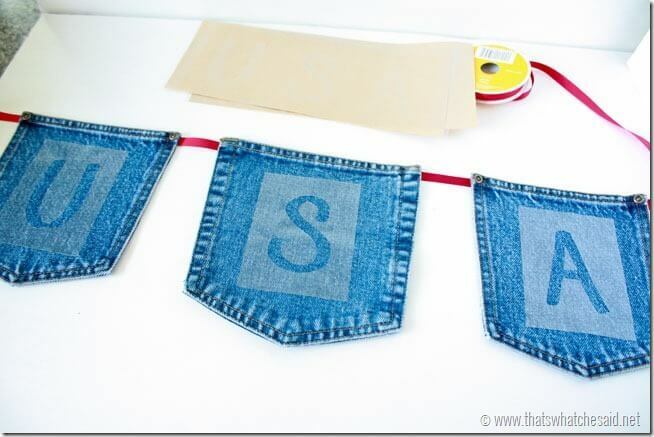 Wow – this is really a cute idea!!!! 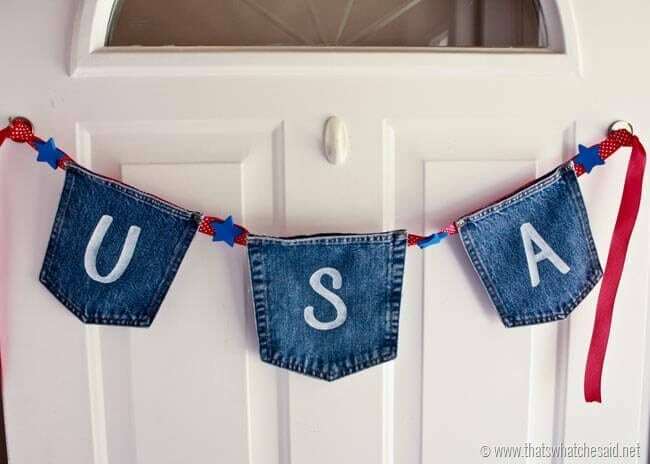 I’m pinning this to my July 4th Party Ideas Board! I made one of these over the weekend. 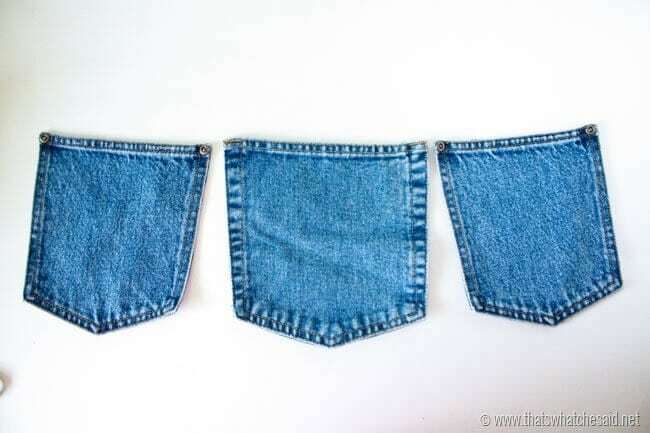 It was easy to make using stuff I had around the house and turned out great. Thanks for the idea. Planning to use it this Friday for our 4th of July celebration. You are so welcome Regina! Thanks for sharing! I love to hear when others actually make the projects I post about! Have a great holiday weekend!